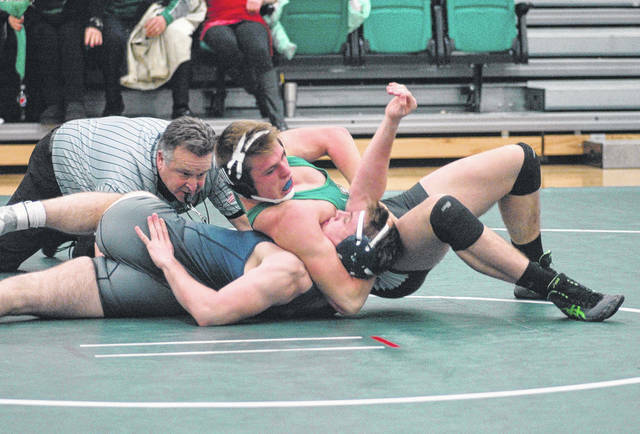 CLAYTON — After forfeiting matches at 106, 120 and 126 pounds and suffering a 10-0 major decision loss at 113 pounds the Northmont wrestling team found itself trailing Edgewood 22-0 Friday night. Watch the video of Northmont’s senior wrestlers being recognized prior to the match against Edgewood. The outlook was bleak but the Thunderbolts managed to fight back to score a narrow 41-40 victory on Senior Night. Northmont picked up its first win at 132 pounds where Andrew Knick won by a fall in a minute and 45 seconds (1:45) against Kyle Chasteen. Edgewood countered with a victory at 138 when Justin Boyle won by a fall in 53 seconds against James Wilson. Ezra Smith scored five points for Northmont by scoring an 18-3 technical fall over Landon Howell in the 145 pound match to cut the Cougars’ lead to 28-11. Freshman Eli Newburg took a 14-3 lead in the 152 pound match against Jarett Faris before winning by a fall in 3:51 to reduce Edgewood’s lead to 28-17. At 160 Mason Sigler won by forfeit to make the score 28-23. Northmont suffered a setback in the 170 pound match. Lincoln Howell of Edgewood held a narrow 3-2 lead after the first round and went on to win by a fall in 2:57 against Fouad Saleh to increase the Cougars’ lead to 34-23. The Thunderbolts got a big win in the 182 pound match when Phil Tracy won by fall in 1:48 against Dylan Robinson to pull Northmont to within five points, 34-29. Senior Dylan Moran scored the fastest victory of the night in the 195 pound match by pinning Nicholas Herbst in just 10 seconds to put Northmont on top 35-34. Junior Bryan Heyward (220 pounds) also won by fall in 52 seconds against Jacob Sousa to increase the Thunderbolts’ lead to 41-34. 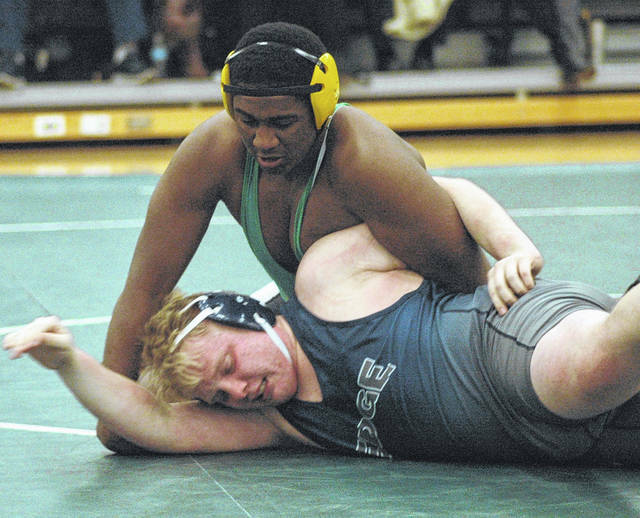 Northmont appeared to be on its way to another victory in the heavyweight match where Seth Frantz led 5-2 after the first round, 8-2 after two rounds and was ahead 10-2 against Nick Hobson. Hobson avoided getting pinned three different times by rolling out of holds most opponents would find impossible to escape from. All he had to do was ride Hobson to finish the match, but after Hobson’s last escape Frantz followed the instructions of one his coaches on how to apply a pin, and that proved costly. Frantz followed the instructions to get Hobson on his back, but once again Hobson squirmed out of the hold, flipped Frantz onto his back and applied a pin with just 11 seconds left in the match to secure a victory for Edgewood making the final score 41-40 in favor of the Thunderbolts. Bryan Heyward gains the upper hand against Jacob Sousa. Heyward won by a fall in 52 seconds. Phil Tracy won by fall in 1:48 against Dylan Robinson to pull Northmont to within five points of Edgewood.